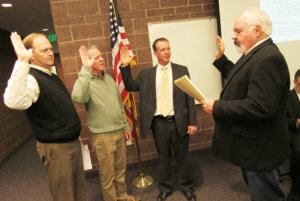 Paul Gottfredson, South Sanpete School District administrator, swears in (L-R): David Warren, re-elected board member, Gary Olson as vice-president and Mark Olson as president of the school board for the coming school year. MANTI—Both Manti High School and Gunnison Valley High School music programs are getting a boost following a board-approved allocation of $20,000 each for new equipment. Brian Sullivan, a Manti High music teacher, explained that percussion students were forced to share equipment, such as having two students using the same keyboard. Manti High will use their new allocation for some much-needed percussion instruments. The board also approved the same amount for the Gunnison music program. Both music programs received high praise from the board. “I love to come to games because the school bands add so much to the atmosphere; they’re all really good,” said board member David Warren. The upgrades for both schools will be finished in about a week when the final elements of the sound systems will be installed. District administrator Paul Gottfredson also presented the yearly audit for the board to review. 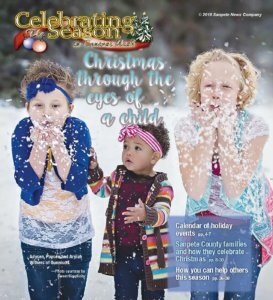 “We’re basically half-way through the year, and the district has spent $15.8 million of its total $40.2 million budget, and the district has received $15.3 million of its revenues. We are right on schedule, and the budget looks good,” he said. District Superintendent Kent Larsen said the district was launching a first annual “District Innovation Week” Feb. 4-8, encouraging teachers and students to be creative. Prizes will be awarded as students design, build, craft, construct, write, draw, invent and explore. Jason Strate, representing the Central Utah Education Services (CUES), presented the annual report of services to the board. He reviewed several programs CUES offers the seven school districts it serves, and focused on a recent $240,000 grant to train rural teachers to help them receive certification in science, technology, engineering and math (STEM). Five teachers from the South Sanpete School District are currently being trained, with more to follow. He also reported on computer and data storage services that CUES provides. Since the district has issued around 3,000 iPads to students, it was noted that most of the repairs to those iPads were for cracked fronts. Nadean Nielson-DeMill, district technology director, noted that among schools where students had a strong sense of responsibility for their iPads, there were less broken screens. “Most of the screen damage is in higher school grades,” Nielson-Demill said. “Most of the elementary students are very careful with their iPads.” She did feel that overall students took very good care of their iPads. Finally, the board reviewed policies on curriculum requirements, human sexuality curriculum, vehicle purchases, at-risk student definitions and board elections before closing the open meeting and going into executive session. The next board meeting will be Feb. 12 at 3:30 p.m. in the Ephraim Middle School.